"Whilst it might not be in the middle of a scrum, there is a place for you to thrive!" “After playing touch rugby throughout primary and secondary school, I started to play contact rugby during sixth form with a newly set up girls team. In the early days we really struggled to make up numbers, as when we said ‘yeah, it is full contact!’ people usually ran a mile. And that’s because it’s true, the idea of throwing yourself at another person as they’re charging at you is fundamentally scary! Personally, the thought of not only being tackled but doing the tackling terrified me, as I am usually the smallest member on the pitch, and have been (and am still frequently) told that I’m not the right build to play rugby due to being 5ft3 and weighing 50kg. Even though people mean it as a joke, it can be so discouraging when you’re told that you won’t be good at the sport you love just because you don’t fit the stereotype of being super strong, big and muscly. However, I love proving people wrong so I carried on going to training sessions after school, and realised that the combination of my speed and desire to get involved, fuelled partly by comments that made me doubt my ability, meant that I actually wasn’t at a disadvantage just because of my size. The more I played the more I came to understand that rugby is as much about mentality as it is physicality, and that if you are willing to throw yourself in to drills and matches you can do just as well as the girls that can sometimes be almost a foot taller than you. With this in mind, after playing rugby for my college during my fresher’s year and really enjoying it I decided to try out for the Durham University Sevens team, and after being given a place began to train to play a form of rugby that suits my skill set perfectly. Sevens is a game driven by speed and agility, and, whilst the training was gruelling, the experience of the season reinforced that whilst I don’t immediately stand out as someone who plays rugby, that doesn’t mean that I shouldn’t and can’t. Olivia played her first match for Durham University 2nd team recently. She really performed, and stood out as one of the best players on the pitch! 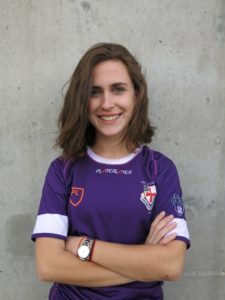 Olivia has worked hard, against all the odds, to become a brilliant and indispensable member of the Durham University Rugby Club. Inspired? Durham City RFC have started running a weekly women’s training session, Thursdays, 7-8pm at Durham City Rugby Club, DH1 3JU. No previous experience is required, the sessions start from the basics! Females from age 13+ welcome! !